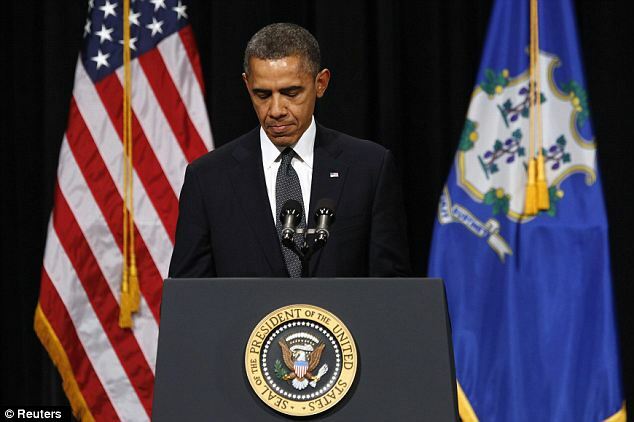 Speaking at an inter-faith vigil in Newtown, President Barack Obama has said the US must do more to protect its children in the wake of Friday’s shootings at Sandy Hook Elementary School, Connecticut. Barack Obama said he would use the powers of his office to prevent a repeat of the tragedy. He told residents that the nation shared their grief. The first funerals for victims will be held on Monday. The gunman has been identified by police as Adam Lanza, 20. He shot dead his mother before driving to the school in her car. “I come to offer the love and prayers of a nation,” Barack Obama said, speaking after religious leaders and the state governor. Barack Obama repeated a call for action against gun crime, saying that in coming weeks he would use “whatever powers” his office held “in an effort aimed at preventing more tragedies like this”. “We can’t tolerate this anymore,” he said. The complex causes of gun crime “can’t be an excuse for inaction”, he said. Barack Obama was also meeting victims’ families and emergency service workers. Police say the process of releasing the victims’ bodies to their families is under way. Connecticut Governor Dannel P. Malloy said his state had an existing ban on assault weapons, but the lack of a similar law at federal level made it difficult to keep them out of the state. “These are assault weapons. You don’t hunt deer with these things,” he told CNN. Governor Dannel Malloy had to break the news to most of the victim’s families on Friday. “You can never be prepared for that – to tell 18 to 20 families that their loved one would not be returning to them that day or in the future,” he said. New York Mayor Michael Bloomberg, another strong gun control advocate, has urged President Barack Obama to act. “We have heard all the rhetoric before,” he said. A nationwide ban on certain semi-automatic rifles in the US expired in 2004.